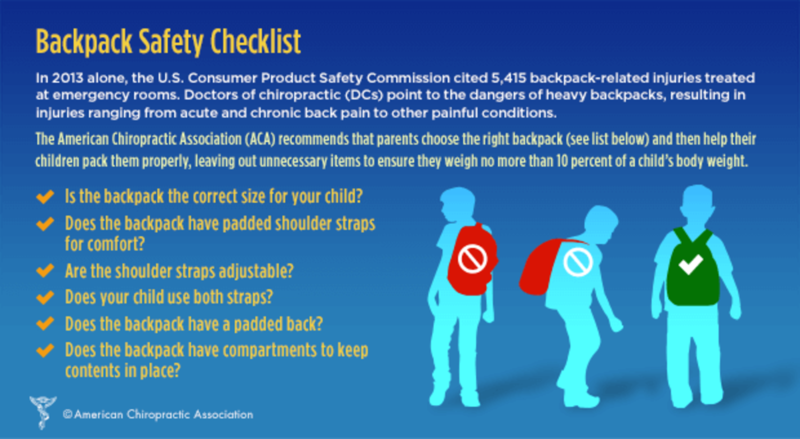 Does Your Child Have a Back-Safe Backpack? It&apos;s back-to-school season which means it&apos;s time to start stocking up on notebooks, #2 pencils, and a backpack to carry it all in. If your kids&apos; schools are anything like mine, the popularity of rolling or wheeled backpacks has continued to rise. But does your child need a rolling backpack? And how can you choose a back-safe backpack if you opt for a traditional backpack? Here&apos;s are six tips to select the best backpack for your child. According to the American Chiropractic Association (ACA), your child&apos;s backpack shouldn&apos;t weigh more than 10% of their body weight. So a 50-pound child shouldn&apos;t carry more than 5 pounds, a 100-pound child, no more than 10 pounds. If the backpack is heavier, it will cause your child to lean forward in an attempt to balance the weight on her back instead of on her shoulders, putting undue strain on the shoulder, neck and back. Despite what you might think, the ACA doesn&apos;t suggest every student use a rolling backpack. In fact, they recommend that rolling backpacks "be used cautiously and on a limited basis by only those students who are not physically able to carry a backpack." Instead they recommend choosing a supportive backpack and taking steps to try to limit what students carry. 1. Is the backpack the correct size for your child? The backpack should never be wider or longer than your child’s torso, and the pack should not hang more than 4 inches below the waistline. A backpack that hangs too low increases the weight on the shoulders, causing your child to lean forward when walking. 2. Does the backpack have two wide, padded shoulder straps? Non-padded straps are not only uncomfortable, but also they can place unnecessary pressure on the neck and shoulder muscles. 3. Does your child use both straps? Lugging a heavy backpack by one strap can cause a disproportionate shift of weight to one side, leading to neck and muscle spasms, low-back pain, and poor posture. 4.Are the shoulder straps adjustable? The shoulder straps should be adjustable so the backpack can be fitted to your child’s body. 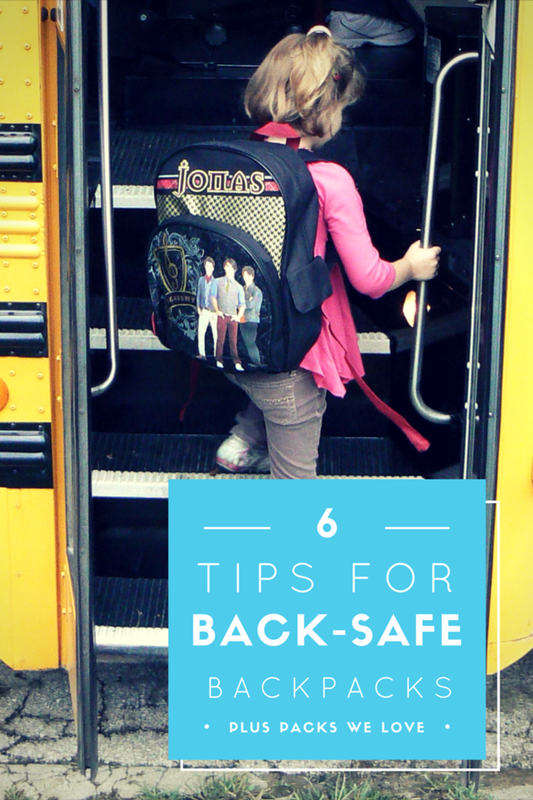 The backpack should be evenly centered in the middle of your child&apos;s back. 5.Does the backpack have a padded back? A padded back not only provides increased comfort, but also protects your child from being poked by sharp edges on school supplies (pencils, rulers, notebooks, etc.) inside the pack. 6. Does the pack have several compartments? A backpack with individualized compartments helps position the contents most effectively. Make sure that pointy or bulky objects are packed away from the area that will rest on your child&apos;s back, and try to place the heaviest items closet to the body. 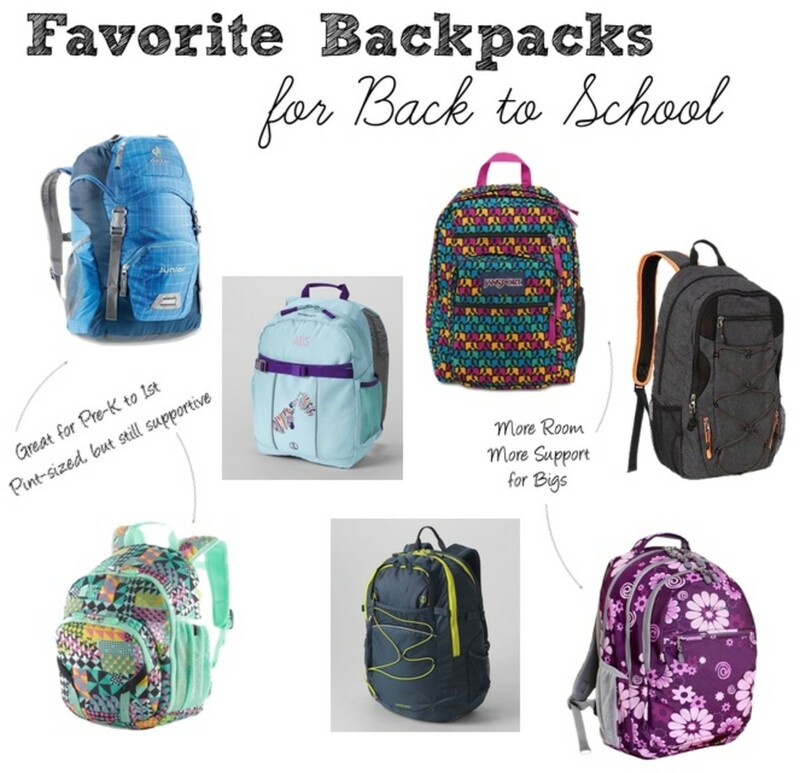 Whether you have a new kindergartener just starting school or a how-did-he-get-so-big middle schooler, here are some of our favorites back-safe backpacks for back to school. Check out more back-to-school favorites in our BTS Guide below!